Some Haitian lawmakers opposed to president Jovenel Moise are expecting to maintain power should President Jovenel Moise leave office but the opposition in the streets has a different idea. During a chat with radio Caraibes FM, Opposition leader Andre Michel said "For all the people talking about parliament, we will NOT bring the power to the Deputes and Senators." Verite a sou tambou, majorite silencieuse la di ase. Sa ki nan lari a la a, se pa sa ki te sou beton an depi 2 zan ki pase yo. Se pa mouvman opozisyon an li ye, se mouvman pep souveren ki pran destin li an men. An nou swete, pyes zago loray pa vinn Mennen nou chemen gwochi. Se verite, Jovenel pa ka rete. Pep souveren dwe pare pou jere peyi a byen. Wout dwat la se konferans nasyonal, palman kraze, yon gouvenman pwovizwa kap aplike mezi d'austerite nan tout leta a, yon konstitisyon amande, epi eleksyon jeneral nan 2 zan maximum. In the absence of the president, it is always the deputies and senators who will remain to arrange for fresh election and reinstalled a new president. 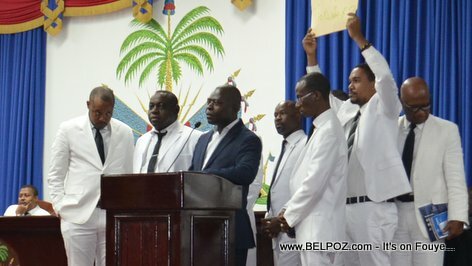 2 chanm yo, kiyes nou vle bay pouvwa a si jovenel ale?